The diagnosis of drug resistance in pulmonary TB generally relies on performing susceptibility tests either directly on sputum specimens or on the isolate grown in sputum culture. An interesting article in Clinical Infectious Diseases addresses the question of whether the susceptibility pattern in sputum tells the whole story. Figure 1 - These diagrams represent populations of M. tuberculosis bacilli within a lung cavity (large circle). Drug-resistant bacilli are present; the predominant population being resistant to drugs A& B. Due to spontaneous mutations, there are bacilli present with additional resistance to drugs C & D.
They report a case series, from a referral centre in the Republic of Georgia, of 50 drug-resistant TB cases that had undergone surgical lung resection and had paired sputum and lung tissue specimens, specifically from a lung cavity. The patients had been treated for drug-resistant TB for an average of just over one year. The specimens were cultured using either solid (Lowenstein-Jensen medium) or liquid (MGIT 960) media. Drug susceptibility testing (DST) for first- and second-line drugs was performed using the concentration method. Eighteen patients (36%) had a positive culture with DST results from both the pre-operative sputum specimen and lung tissue. In seven of these cases DST revealed additional resistance in the lung tissue isolate compared to the isolate cultured from sputum. In four cases this included extra resistance to the fluoroquinolone (ofloxacin) and in three cases this included extra resistance to injectable agents (kanamycin or capreomycin). Overall in four cases the sputum isolate would have been classified as pre-XDR whereas the tissue isolate would have been classified as XDR-TB. How can we explain these findings? This study was unable to confirm that the strains in sputum and lung tissue were identical (no genetic analysis was performed) so it is possible that this represented mixed strains within the same patient. However, a previous similar study did demonstrate identical strains but with different susceptibility patterns in sputum and lung tissue. It is well known that the compartmentalisation of bacilli promotes the acquisition of drug resistance in M. tuberculosis as certain drugs are more active in different environments. The penetration of second-line drugs into lung tissue, particularly lung cavities, is poorly understood. It is possible that differential penetration of drugs into the lung cavities predisposes to the emergence of further drug resistance in those populations (see Figure). Does this have any relevance for the diagnosis and management of drug-resistant TB? It is clearly neither practical nor desirable to obtain lung tissue for culture for all drug-resistant TB patients! But we should remember that the susceptibility pattern in sputum may not be completely representative of all the bacillary populations present at the site of disease. This is an important consideration in patient failing to respond to MDR/XDR-TB treatment. Whether modification of the drug regimen or surgical removal of the lung cavity leads to better clinical outcomes in these cases is open to question. 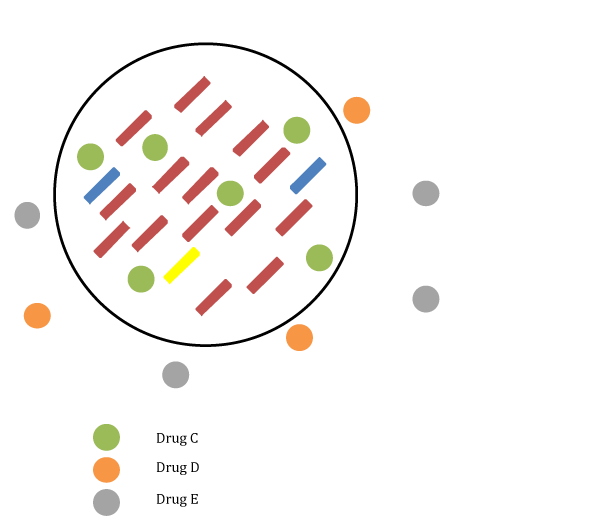 Figure 2 - The bottom diagram shows the situation under treatment with a combination of drugs (drugs C + D + E): drugs D & E cannot penetrate into the lung cavity whereas drug C can. There is therefore effectively monotherapy within the lung cavity with drug C and this drug pressure enables the selective growth of bacilli resistant to drugs A & B & C, which then becomes the dominant population. KRISP Blogs: Drug resistance in Mycobacterium tuberculosis: do sputum specimens tell us everything?